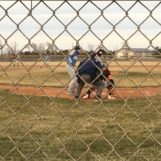 Scott City, Kan. (westernkansasnews.com)–On a windy Tuesday afternoon, Scott City hosted their second doubleheader of the year, facing a quality Spearville Lancer squad, who is coming off a Class 2-1A State Baseball Championship. While the Beavers never led in either game, they were in both games for the most part. The first game would be a wild affair, with the Lancers taking the game 13-12, while they would pull away late in the second game for a 9-4 win. This game would go for nearly two and a half hours. Spearville struck first in the top of the first inning with three runs, and would eventually tack on three more in the second to take a 6-0 lead. The Beavers would rally in the second with an RBI groundout by Ryan Cure, scoring Jeffrey Nix to pull to within 6-1. They would add three more runs in the third to get to with 6-4. Spearvilled added to their lead with a pair of runs in the fourth inning to make it 8-4. Scott City made their first big rally with a four-run fifth inning, by a Nix bases-clearing triple pull to within 8-7. Nix would eventually score to tie the game at eight. However, the Lancers would pull away in the six with five runs to push their lead to 13-8. The Beavers would add two in the sixth, and two in the seventh to make it 13-12. They had the bases loaded in the bottom of the seventh, but struck out to end the game. Kolton Bennett and Josh Cox had two hits and drove in three runs apiece for the Lancers, while Jaedon Pedigo had two hits and two RBI. Cole Stephenson picked up the win, going 3 1/3 innings of relief, giving up eight runs, six earned, on six hits with four strikeouts. Kenny Zimmerman gave up four runs, one earned in 3 2/3 innings. Jeffrey Nix took the loss, going two-plus innings, allowing three runs on two hits. Harrison King had eight strikeouts, and surrendered six runs, one earned, on four hits. Nix had two hits and four RBI, while Easton Lorg had two hits. Spearville outhit Scott City 10-8, but had six errors to the Beavers’ three. While this one didn’t have the excitement as the first, it did play out much closer than the final indicated. Just like the first game, the Lancers would lead 6-1 through two innings. This time around, Scott City would score their run in the first inning. Spearville scored three runs in each of the first two innings, with the second inning seeing the Beavers commit three errors, turning into unearned runs. The game would remain scoreless until the fifth inning, when Scott City pulled to within three runs at 6-3. In the seventh, the Lancers would virtually put the game away with three runs, as the Beavers were only able to add one run and fall short 9-4. For Spearville, Kenny Zimmerman and Josh Cox had a two-RBI game, as five players had one hit. Logan Hubbell went 4 1/3 innings in relief for the win, giving up three runs, two earned, on four hits. Mason Dean went 2/3 innings to start. Blaine Culp had three hits in the second game with an RBI for Scott City. Ronnie Weathers also drove in two runs. Easton Lorg took the loss, giving up six runs, three earned, on three hits in four innings pitched. Scott City is 0-4 on the season, and will begin GWAC play at Ulysses next Tuesday. Spearville is 2-0 overall and faces Wichita County on Friday.